Last Wednesday, September 9, Kings County Tennis League held its Sixth Annual Fundraiser at M1-5 Lounge in TriBeCa. Entitled "Serving Courtside," the celebration was a fantastic night out in support of our goals to expand, extend, and enrich youth development and community building through tennis. To complement our fundamental operations--bringing tennis to children right where they live--Serving Courtside brought tennis to the masses in a centrally located space. 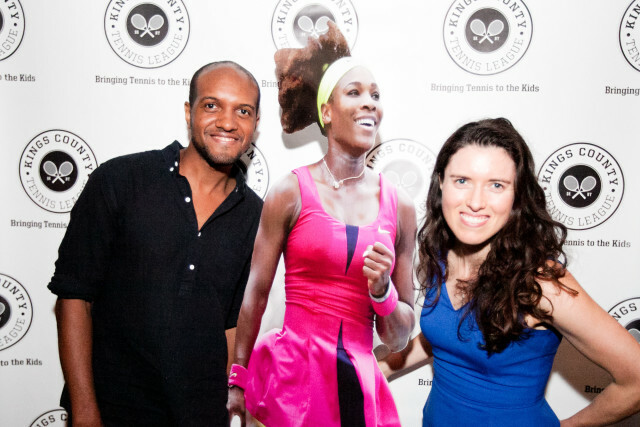 Complete with synthetic grass, portable tennis nets, racquets, tennis balls everywhere, and a Serena Williams cardboard cutout, Serving Courtside presented the ultimate tennis party experience to more than 200 guests. The fundraiser was immensely successful for the organization. We can't say thank you enough to everyone who joined our celebration. We're extremely grateful for our beverage sponsors, Sixpoint, Flatiron Wines & Spirits, and Purity.Organic, as well as for our synthetic grass sponsor, SYNLawn New York. We'd also like to thank our raffle donors, whose names and generous prize contributions are detailed on the official event page. View the event highlights on Facebook. Peruse the event program to learn more. In the Spirit of Our Fundraiser, Serving Courtside, Tell Us Why You Serve! Invitations have arrived! Serving Courtside, Kings County Tennis League's Sixth Annual Fundraiser, was officially released to the public yesterday, June 24. It's going to be held on Wednesday, September 9 at M1-5 Lounge in TriBeCa. We're excited to make this the biggest, most wonderful party yet, and we're calling on you to play a part in this victory for KCTL. Just like the event's name implies, our Annual Fundraiser is an opportunity for all of KCTL's supporters to gather together to serve--and celebrate--the program off the tennis court. If you're KCTL supporter in any capacity--parent, player, volunteer, friend or acquaintance--show off your experience with the program using #IServeBecause on Facebook, Twitter or Instagram. Aside from our #IServeBecause social campaign, be sure to come back here, to our blog, for a special #IServeBecause series featuring a new KCTL supporter each week. You'll be able to learn about how our tennis-mentorship program positively impacts everyone involved at the individual level.